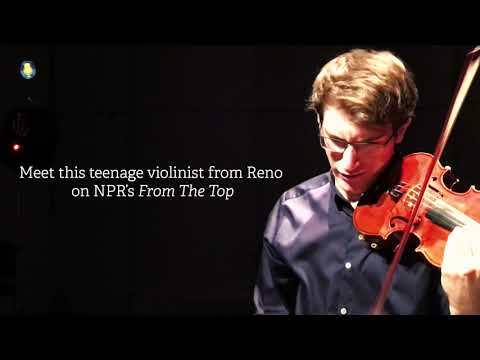 From the Pioneer Center for the Performing Arts in Reno, Nevada, this week’s From the Top features a local 17-year-old violinist who’s had an asteroid named after him, a young pianist thrills the audience with a piece by Ginastera, and the winners of the junior division of the Fischoff National Chamber Music Competition performs Bartok. I. Allegro assai from the Sonata for Violin and Piano No. 8, Op. 30, No. 3 by Ludwig van Beethoven (1770-1827), with Christopher O’Riley, piano. I. Allegro marcato from Piano Sonata No. 1, Op.22 by Alberto Ginastera (1916-1983). Fantaisie for Flute and Piano by Philippe Gaubert (1879-1941), with Christopher O’Riley, piano. V. Allegro molto from String Quartet No. 4, Sz.91 by Béla Bartók (1881-1945). III. Perpetuum mobile. Allegro from Violin Sonata No.2 by Maurice Ravel (1875-1937), with Christopher O’Riley, piano.